Be it a 7-year old kid or a 70-year old man, everyone loves to watch animated cartoons. It is a moment where the old can relieve their childhood days. But the hard work and toil taken to create even few seconds of cartoon series are huge. Cartoon series have emerged a lot. The first ever computer animated movie was introduced in the year 1998. It took everyone by surprise. Now a lot of students are entering the field of animation. Now there is a more advanced feature which helps to create the story down to the detail. But still, the process for learning animation is complex. Many are still looking for free animation software for beginners to learn on their own. 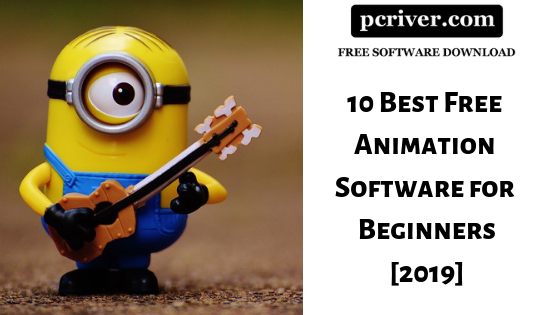 So in order to help those talented ones our PCriver team has come up with this Best Free Animation Software List which will be really useful for the beginners who are planning to get into the animation field. Below we have listed a few of the most amazing animation software. KeyShot tops the list of being the animation creating software. It has capabilities which capture even the minute details of the creation being recorded. It supports both 2D and 3D animations. There is a camera control feature that enables all its users which helps the animating object synchronize with the real-life behavior. It is fast and pretty powerful in its features. Download Keyshot for Free from it’s official website! True to its name this software will allow users to easily create animations if they are really good at working on paper. Creating 2D animation becomes easy with this software as one can work in the traditional way. It has a very friendly interface which allows working seamlessly. After a little understanding of this software, one can enjoy their animating effectively. It is one of the 2D animation software. Download Pencil2D for Free from here. Blender is open-source software used for animation. The thing we love the most about this very software is its mirror functionality. While going through this software (which is available for free!) we discovered that individual characters during animation can have non-linear movements and different poses. Again I repeat, it is fun to use while creating powerful 3D designs. If you need the best free animation software, go for this one today. Download Blender for Free from here. This software allows its users to produce the perfect 2D animation. We loved the styles and different picture distortion. Also, a message to all our budding future professionals reading this, this software is going to understand you and will go with your needs. So this is one perfect animation software too. Download OpenToonz for Free from its official website. The most unique thing about this animation is, it is built for beginners only. This animation software will offer you a wide range of options. All the beginners take notice, that the working area offered by gives its users a wide working area. The software has a unique feature where it divides the screen into four parts and has tools that are really easy to use and are good for beginners. It has elements which are really good for the development of skills. It will offer you features which will allow you to draw and get a good grip. Download Synfig Studio for Free from here. The Stykz tool is free for use. It has striking features which allow creating animation easily. It has features that have operating systems which include Max, Linux, and Windows. Almost all the users will agree to the fact that the interface is quite friendly. Download Stykz for Free from here. The Aurora Animation Software can turn everything into the 3-dimensional objects, even texts! There are some special effects that you can add which includes seasonal effects such as snowfall and flames. You can also convert your file into any GIF or some video formats. With all these amazing features being offered to you, we also found that one can avail a free trial period during the time period. Download Aurora 3D Animation Marker from here. This is an animation software packed with features. You can save your animation on the cloud. The animating objects can be rendered and model for free. This software has a library with wide options available. This animation software has got many users where they can interact and discuss their creation. Download Clara.io from here! Even though you will get a few limited features while using its trial version, but if you want to be a professional then we recommend using this animation software because it is loaded with stuff. It is the best 3D animation software which has the friendliest interface. In the background, you can enhance your images or animation while adding a lot of backgrounds. These are few of the best animation software that we loved. Some of them are free animation software while others are a bit paid ones. All the animation software are loaded with features which take your creative imagination to another level. There is a huge scope for everyone who has chosen this stream. These programs are compatible with your desire to become a professional. You can try any of these above ones based on your needs and then learn animation slowly by implementing the blog tutorials step by step. You can even share other free animation software for beginners if you know any in the comments section. By doing so, you are helping your fellow reader to know about it, thereby helping them get good animation software. Also checkout our insights on- Top useful websites for students.